A new French Vision Series vacuum hydraulic press model, available from 30 to 150 tons, is specially designed for customers molding composite parts. 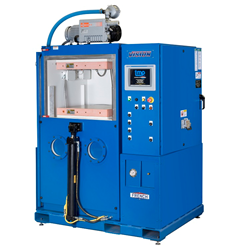 Features such as a vacuum chamber, electrically heated platens, a microprocessor-based advanced control system and an industry leading 3-year warranty yield multiple cost-saving customer benefits and improved part quality. A new French Vision Series vacuum hydraulic press model, available from 30 to 150 tons, is specially designed for customers molding composite parts. Multiple press features such as a vacuum chamber, electrically heated platens, a microprocessor-based advanced control system and an industry leading 3-year warranty yield multiple cost-saving customer benefits and improved part quality. The Vision composite molding press, pictured in a 50 ton model, features electrically heated platens with a steady state working temperature of 500° F. The platens are also further drilled for water cooling circulation. The press construction has slab sides with keyways machined in sets to provide correctly proportional loading and exact parallelism of matching components. The vacuum chamber is formed by heavy duty doors that are mounted to the front and back sides of the press. The front door moves up and down based on the press automatic cycle and the rear door is hinged to allow ease of press service. The vacuum pump eliminates entrapped air and moisture in the composite materials and removes entrapped volatiles caused during the molding process that can reduce part quality. A vacuum transducer is incorporated in the press system to indicate and control vacuum, which can be based on preset timers or vacuum level parameters. The press pump can be sized to draw full vacuum in 2 minutes or less, for faster cycle time. The press includes a microprocessor-based advanced control system, designed by French and TMP, A Division of French engineers to improve part quality through better processing accuracy, repeatability and versatile process-control programming to monitor data for user analysis. The color touchscreen is operator-friendly and the system is easily utilized to program the machine recipe and control molding parameters such as platen temperature set points, hydraulic pressure and pressure de-gas for the automatic cycle. Temperature and pressure ramp rates are also easily programmed. Customers may choose from a variety of additional press options including loading and unloading automation, more robust recipe storage and data collection, high temperature heated platens and platen cooling. In addition, specialized UNI-TEMP heated platens for even more advanced temperature control are available. To learn more about this press visit with our hydraulic press group vice president, David Sledz, in the French and TMP, A Division of French booth L36 at the CAMX Expo taking place September 26-29, 2016, in Anaheim, California. French Oil Mill Machinery Company custom designs, manufactures and supports French and TMP brand hydraulic presses for composite and rubber molding, laminating, forming and bonding products for a variety of industries. Presses generally range from 20 to 2,000 tons, with various heated platen sizes, for compression, transfer, lamination or vacuum molding. French and TMP engineers continually improve press designs through quality driven programs and with enhancements in automation and electrical control systems. French and TMP presses are well known for their superior value, low deflection, rugged construction and long life, all of which optimize the customer’s process, improve part quality and deliver the lowest life cycle costs.